I started training whilst at school under Master Russell Dennis (VII Dan) (who was my Chemistry Teacher). I achieved my 1st Degree Black Belt in 2004 just as I started a Geography Degree at the University of Birmingham. Whilst at Birmingham I represented the University in the WTF (Olympic Style) winning the student national competitions for both sparring and breaking. I later went on to study for a PGCE and a Masters degree in Learning and Teaching at The University of Oxford. Whilst Studying I gained a coveted ‘Oxford Blue’ representing the University in the Varsity Match and student nationals. I have represented England in both sparring and power test (individual and team events) at several international competitions and tournaments. These include the 2013 ITF World Championships in Spain and the ITF European Championships in Sweden (winning Bronze for sparring and coming 4th for breaking. 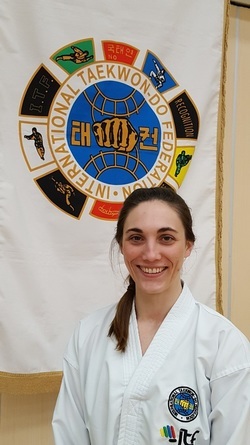 In 2015, I competed at the ITF World Championships in Italy (winning silver for individual sparring and bronze for team sparring) and the ITF European Championships in Scotland (silver in team sparring and bronze in team power). I am a fully qualified teacher with a Masters in Teaching and Learning and taught secondary-school Geography for six years. I now train and assess aspiring teachers, while continuing to train in and teach Taekwon-Do. Qualifications: International Instructor/Examiner Cert No.2950, ITF Instructor Plaque No. 608223, MSc, BSc, PGCE, DBS checked*, First Aid qualified, ITF Umpire Cat C.
Having met my future wife whilst studying for a BSc in Sport and Exercise Science at the University of Birmingham, I was persuaded to attend my first lesson in 2005. However, work commitments prevented me from attending regular training for several years. I moved back to Surrey in 2008 and my commitment to Taekwon-Do has been increasing ever since. I graded to 1st degree under Master Dennis in 2011. Since then I have competed in various competitions (as a participant and umpire) and attended various Taekwon-do seminars. The highlights this year have been the Master Cooley seminar (the Irish National Coach) orgnaised by the VTA and attending the International Instructors Cource (IIC) in Paris, France. I am currently a 3rd Degree Black belt and continue to train weekly to master my own Taekwon-do skills. I assist Laura in the design and execution of training at Swift Fox TKD and teach at Mr Adams classes too. Qualifications: ITF Instructor Plaque No. 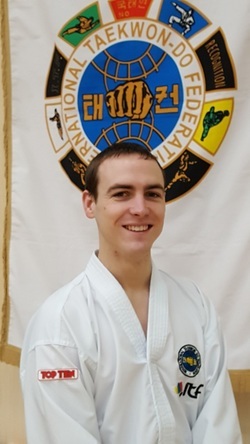 502627, BSc Sports Ex, DBS checked*, First Aid qualified, ITF Umpire Cat C.
Mr Adams is our current Taekwon-Do Instructor and we are delighted that he is our school's senior grading examiner also. He is a full time Instructor with over 200 students (white belt to IV Dan) currently training under him. He has been teaching Taekwon-Do and self-defence classes for the last 16 years. As well as running his own taekwon-Do classes, Mr Adams works with local schools both privately and through the 'Sainsbury's Active Kids' & Sport Relief schemes to encourage participation and an active life style in children. He currently holds the post of Assistant Coach to the National Squad and regularly coaches at international competitions such as the European and World Championships. Several of his students have won selection for the national team over the last eight years. Mr Adams regularly attends ITF training seminars most recently the International Umpire Course in Hungary and the International Instructors Course in Scotland. Qualifications: International Instructor/Examiner Cert No.1583, DBS Checked*, First Aid qualified, ITF Umpire Cat B. * DBS stands for "Disclosure and Barring Service" which is the UK government checks for working with children. These were formally known as Criminal Records Bureau (CRB) certificates. All instructor certificates and qualifications are avilable to view on request.